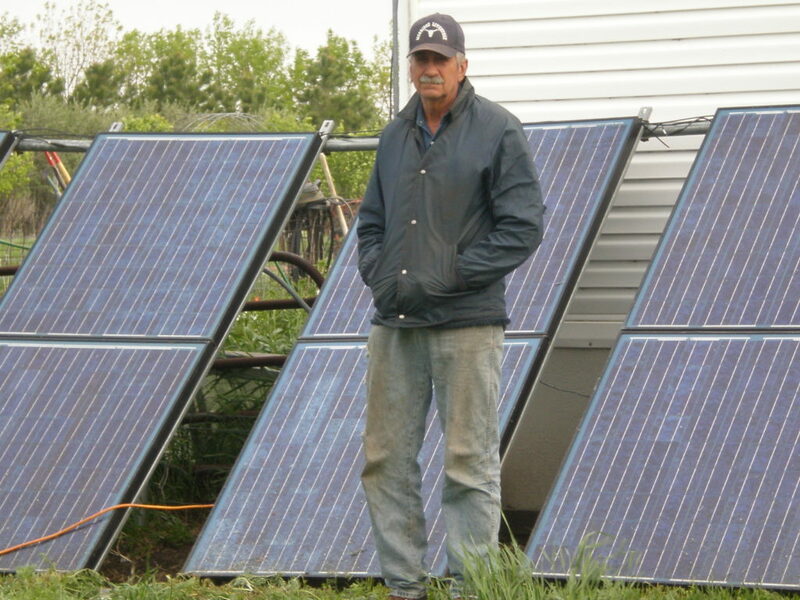 Home Energy Member Projects Wind, Solar and Organic … Oh My! Wind, Solar and Organic … Oh My! Julie and I (Bill Rosin) are on a certified organic farm/ranch in north-central South Dakota near Selby. We’ve been certified since 1996. We grow a variety of small grain and have a herd of Angus beef cows, whose calves are also certified organic. We are also practitioners and students of Parelli natural horsemanship. We have a real “old MacDonald’s” farm, not only because we’re kind of old, but there is variety of critters here…chickens, ducks, geese, guineas, three breeds of sheep, dairy goats, a few jersey cows, a mama pig and five piglets, seven horses, a mule, six dogs, and the usual farm cats. We live a half mile from the nearest road, so most everything is truly free ranging. We also have a pretty big garden, which seems HUGE, however when I measured it, it’s only .12 of an acre. We became interested in producing some of our own electricity because all our grid electricity comes from coal. We wanted to offset at least some of that, while hopefully showing others it could be done. We have had remarkably little interest though; I guess folks still think that if it isn’t being done, it can’t be done. We got our Skystream 3.7 wind charger in June, 2007 from Southwest Windpower, a manufacturer and retailer of wind turbines. The Skystream 3.7 is one of their more popular models; there is several more in use in our area, including one at the local school. These units can put out up to over 3000 watts on a windy day. The local school’s wind charger has recently put out over 50 kWh in one day, which is a significant amount considering that the average South Dakota home consumes 34 kWh in one day (according to a 2009 analysis from the U.S. Energy Information Administration). Additionally, we have a bank of seven photovoltaic (PV) panels, connected to the same meter as the wind charger. We like them, very simple and trouble free. They are more expensive per output potential than wind, but we bought our panels used from the same dealer that sold us the wind charger. He just happened to have some for sale, so we were lucky. The wind and solar system each cost about ten grand installed. However we didn’t apply for or receive any tax breaks, rebates, grants. We regret not applying for a USDA grant; I think we could have gotten it and would have offset about $2,500. The dealer told us not to bother, back in 2007, competition for the funds were intense, and priority given to bigger projects, but now I think there are better incentives. The PVs put out about 1300 watts at their peak. Interestingly, in winter even though the days are so much shorter, the efficiency of the PV’s increases with colder temperatures, so the output is not affected too much throughout the year. Our system is kind of a nice “hybrid” system. Often one application works when the other isn’t. On bright sunny windy days, the meter spins like mad; I think I should grease it. But of course, with no net metering, we pretty much ‘give’ our excess away. The local utility takes just a few dollars off our bill each month, it’s a pittance. 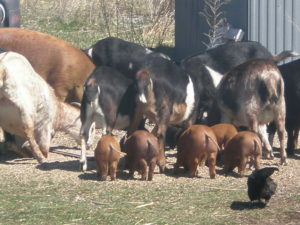 We’ve found that rural electric coops vary in their acceptance and tolerance of these units, ours has been pretty good. I have a friend nearby who has a similar turbine, with just him and his wife in a modest sized home, and their bill is cut substantially. As people become more familiar with the benefits of utilizing small scale renewable energy to produce some of their own energy, many have started to investigate how they too can cut their energy bill. However, along with the increased excitement and interest, there are some things to keep in mind while looking for a system to buy. It’s not my intention to discourage anyone from doing home grown energy, and food, but there are some pitfalls to look out for. Being knowledgeable about these issues before getting into a project can save some significant time and personal energy, since our wind charger sure had its bugs. It was struck by lightning and fried within a week of installation. However the system was under warranty and was replaced by the company. There were also some problems resulting from cold weather, the company seemed to have disregarded that it gets cold up here, but they have since been resolved too. Overall we’ve had two completely new units installed because of problems. The company has been pretty good about getting them replaced, but not all companies are, so it is important to check into their warranty and service policies. Another important feature to look for when purchasing a wind turbine is if it has a vane on the unit housing. A common scenario in SD, the wind blows from one direction one day, calms at night, and next day comes up gradually from the opposite direction, and the turbine will not “flip” to orient into the wind. But the biggest bugaboo, and this is something rural folks need to be aware of….the grid voltages in the country can vary, depending on how far you are from a substation. These turbines are programmed to cut out at about 131 volts, and if you’re near a substation your grid voltage may already be up to 127 or so, and when it’s windy, especially if the turbine is a distance from your house, it boosts the voltage to over the limit. We had that problem for several years, and it really cut into our production. The local utility finally gave us permission to put up to 134 volts in our line at the farm, and we were able to reprogram ours so it works beautifully since. Like everything, it’s computer controlled. 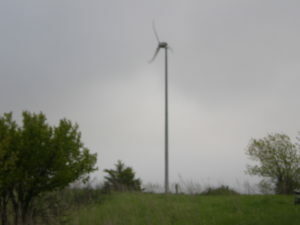 The local school’s wind tower did not have this problem, because it was connected through Montana-Dakota Utilities and towns have their own substation, so grid voltage is always lower. A great solution to prevent this at the utility level is to install devices at the substations to automatically adjust the voltage according to “demand”. Having higher than “normal” voltage is very wasteful, like having more than necessary pressure in a water line. There are utilities that actually subsidize devices to reduce voltage at point of use, and it’s saving both them and customers lots of money, and in some cases eliminating the ‘need’ for more power plants. However a number of utilities can’t, or think they can’t, afford the devices, which is unfortunate since many co-ops have seen an increase in their electricity demand. Due to the big increase in corn and bean production up in this area, and so many more grain bins with air systems to dry grain, according to our local co-op manager. I often wonder if this energy use is ‘figured in’ when an analysis is made of the ‘efficiency’ of ‘modern’ farming. I really think if local energy systems, electric vehicles and renewables would have been a priority for research and development we wouldn’t need to import a drop of oil today. 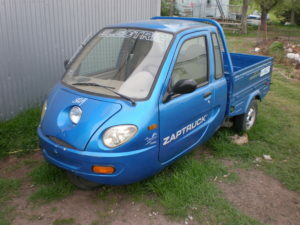 A photo of Zippy, our all electric pickup. It needs new batteries, otherwise I used to be able to go over 20 miles on a charge. It takes about 1500 watts when first plugged in to charge, so if the wind’s blowing, or the sun’s shining, or both, it runs for free.